Bremen supported by the German Excellence Initiative. of one course and taking part in the regular Ph.D.-colloquium. 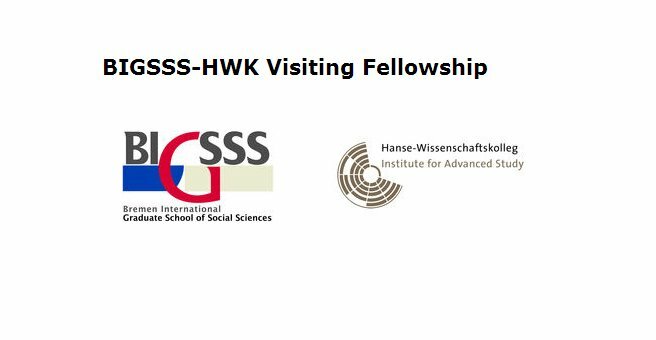 The BIGSSS-HWK Visiting Fellowship offers financial support and accommodation. • Changing Lives in Changing Socio-Cultural Contexts. (1) The exposé should provide detailed information about the planned research project and its relation to BIGSSS’ academic program. This includes standard information such as the topic or research questions, how the topic or research question is embedded within current research, e.g. reasons why the project is original and relevant. Information about the methodology (“approach”, perspective) and methods should be included. A reference list of the literature mentioned in the project outline must be included. The evaluation of Fellowship applications involves scientists from different disciplines. The exposé, therefore, should be composed in a form that makes apparent the relevance and outstanding quality of the project and the applicant’s expertise, even to reviewers of the social sciences who are not immediately familiar with the precise subject area. (2) The abstract should be a summary of the Fellowship project for specialists in your field of research. The abstract should be submitted as a MS Word-compatible text file (doc, docx, rtf) and not as a PDF! Its length should not exceed 1500 characters including blanks. Should an application be successful the abstract may be used for public relation purposes of BIGSSS and HWK. (3) The curriculum vitae should be in table form, and may be arranged either chronologically or systematically. (4) There are no specific requirements with respect to the format of the list of publications. Please send your applications via email to BIGSSS’ Executive Secretary, Dr. Christian Peters (cpeters bigsss-bremen.de) and to HWK’s Research Manager for the Social Sciences, Dr. Susanne Fuchs (sfuchs h-w-k.de). The deadline for applications is October 20, 2013. Late applications will not be considered. The Fellowship is scheduled for the 2014 winter term (October 2014 - February 2015). Please find the ad in pdf. here for download.